Welcome. This blog is a record of my RV12 kit aircraft construction. I hope you find it of interest. First flight (and more) ! 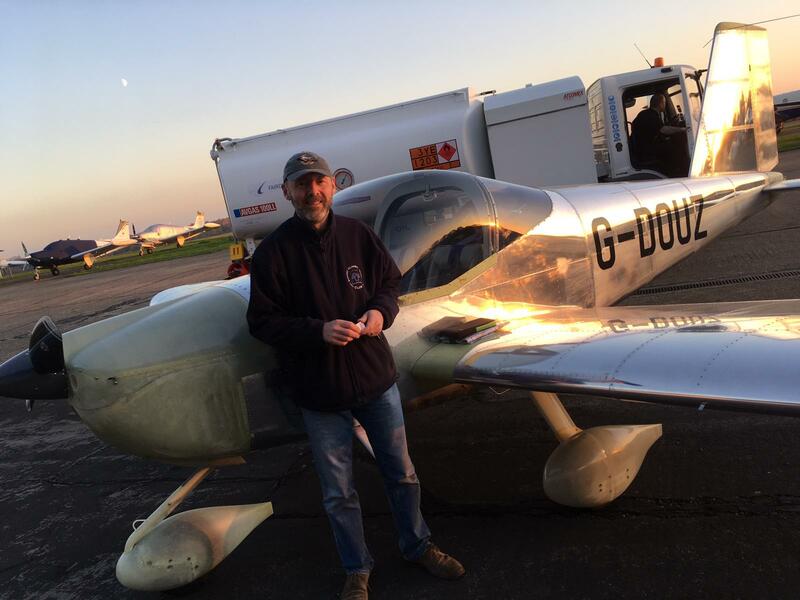 On Saturday 17 November G-DOUZ finally became an aeroplane! In the safe hands of Jerry Parr, my LAA inspector and fellow RV12 builder, the first flight lasted 30 minutes with about 6 circuits of Fairoaks. Jerry about to depart on the first flight. A short video of the aircraft returning. Following the first flight which went fine with no issues at all (Phew - that was a relief), we removed the cowlings for a good look at the engine bay - checking for any leaks and anything loose. Then a good look around the rest of the aircraft before preparing for a longer flight with me on board to do some more shake-down tests. Here we are taxiing out for the second flight -planned to be the required 2 hour duration test. We achieved everything we wanted and then did 10 touch-and-goes and the final landing to build towards the 15 landings the LAA require for the Permit test programme. So at the end of day 1, the aircraft had flown 2 hours 35 minutes and completed 12 landings with no snags and no adjustments needed. Not a bad day at all! Last job of the day was to re-fuel ready for the next stage. A happy owner with a home-built aircraft that flies! With the weather behaving we decided to try and complete the entire test programme over one weekend, so Sunday morning saw us load the aircraft to maximum weight (1320 lbs/ 600Kg) with full fuel and some ballast in the baggage bay, in preparation for the performance height climb test. I didn't get any decent photos in what was a busy flight and it was quite turbulent but did take screenshots from the Garmin G3X to record specific test points, so here are a few which show just how good an RV12 really is! First minute into the 5 minute performance height climb. This is flown at best-climb speed of 75 knots and Jerry did a great job keeping within the 2 knot tolerance and slip-ball centered when you consider the significant wind and bumping around! The G3X has a built-in data-logger which records all of the engine and air data parameters each second, so I didn't need to write everything down. You can easily analyse the data in a spreadsheet. En-route to the test area from Fairoaks. This is the map in front of the co-pilot/passenger but can be switched into a full instrument display as shown in the other pictures. Straight and level Wide Open Throttle (WOT) test to measure the indicated airspeed and make sure the engine doesn't exceed maximum RPM (5800). That's a quick aeroplane to make 120 kts in level flight from 100HP. Max continuous RPM test. Some people regularly fly their aircraft like this but I think something more economical (4800 rpm) is fine as this will still produce 105 kts. Ignore the fuel-flow reading (Litres Per Hour) as it's currently garbage - this needs to be calibrated across several tanks of fuel. The realistic figure is nearer to 18 LPH. We also carried out a Vne (Never exceed speed) dive to 136 kts and checked that the controls performed correctly with small and gentle inputs - all a non-event. The last major test items were stalls in clean, approach flap and full flap conditions and all went fine - a slight right-wing drop as expected but nothing unmanageable. Finally a bit of avionics play-time for me, to check the autopilot and radio. Having installed loads of autopilots in light aircraft, I was really surprised at just how good the G3X experimental autopilot is - it's miles ahead of anything I've played with before in certified general aviation aircraft and the capabilities are huge. Above you can see we're tracking towards a GPS waypoint (CPT) with a huge crosswind of 41 kts and its holding us dead on track. Should make light work of long-distance flying. On completion of this flight which lasted 2 hours 45, we completed a further 3 landings to bring to the total to 15. No snags and a great aircraft to fly. With the test flying all completed, we wrapped up the paperwork and it's all been submitted to the LAA for review and hopefully the issue of a full Permit-to-Fly. As soon as I have that I can get checked-out and finally fly the aircraft on my own. All being well, I'll get to fly about 10 hours over the winter before the aircraft goes to the paint shop in January/February and then I have to take it all apart again! It's been a busy couple of weeks since the first ground run, completing assembly and the remaining ground tests. The culmination of this effort was Jerry's final inspection and submitting the paperwork to the LAA in order to obtain the permit-to-test. So a brief look at what's been going on. First was to install the wheel pants and leg fairings plus the tail-cone covers in preparation for weighing. The belly access panels were fitted, which also included modifying one to allow the fuel tank drain to be accessible. A mandatory requirement is a fireproof identification plate fitted to the fuselage. This was produced by a Boundstone, a local engraving company in Farnborough. I didn't want to fit it on the outside prior to painting, so it's on the left side of the tunnel in the pilot's foot-well. There will be a second one without the registration fitted near the tail once painting is complete. Next came the carpets and side trims, plus the map pocket on the tunnel. Yes, the fireproof plate is hidden, but the reg's don't say it needs to be on show, just that its fitted! The seat belts and seats are fitted. It's going to be a cozy place for two people! The final item to be installed was the Vans optional glareshield together with the UK-mandated standby compass. The glareshield was bare grey fibreglass, so I painted this satin black and installed an edging trim to protect heads from sharp impacts! After the interior was installed, it was time to go back out of the hangar for more engine ground runs, ADAHRS tests and a compass swing. I also wanted to use up some of the remaining fuel. With the compass wing and ADAHRS vibration checks all passed OK, it was time to prepare for weighing. The aircraft had to be de-fuelled to minimum usable level by pumping any remaining fuel out using the electric pump. Here's the first of two 20L cans being filled. For correct weight and balance calculations, the aircraft has to be leveled to flight attitude and placed on scales. I bought three 300kg digital scales and used some ramps from the hangar. Not shown above was the method used needed to get the aircraft level, which could be by adding planks under the main-wheels scales. Instead I let the nose-wheel air out! The empty weight came out at 784.5 lbs, which is a little bit more than I expected, but I do have all of the available options installed. I've since calculated that the aircraft can carry two 13 stone (182 lbs) people, full fuel and 50 lbs of baggage, so there's no loss of capability due to excessive weight. One unexpected problem arose whilst working through the Vans-supplied post-build test programme, in that I couldn't get the stall vane to produce any audio warning. I discovered that Vans don't use stall audio from the Garmin G3X EFIS, instead producing a warning tone from a circuit board in the AV5000 junction box - which I don't have! Therefore I've installed a dedicated stall horn (round white unit above, behind the pilot's instrument panel) which will operate regardless of the G3X or radio working, and allows a standard pre-flight test to be performed. The G3X will still generate audio warnings from the angle of attack system and that will be heard through the headsets, so I have a fail-redundant system. The last job to do was for Jerry to visit and perform the final Permit Release inspection. This involved checking all control range of movements, checking placards and looking at the final assembly jobs and tests I'd been performing over the last 2 weeks. We also put the aircraft on the maintenance trestles as shown above, to check clearances of the wheel pants and leg fairings in flight condition. Finally, we went through the paperwork to ensure everything needed for the application for a permit-to-test was supplied to the LAA and correctly sign-off. Now it's just a matter of being patient whilst the LAA process the document pack and we get the permission to go flying! The finished aircraft ready to aviate! It's been a busy week since moving to the airfield. The aircraft has been assembled, controls rigged, avionics ground-tested and the engine run for the first time! So a brief review. First the final assembly and control rigging. Here I've clamped the rudder between two pieces of plywood so I can mark and drill the rudder cable links. Here I've installed the anti-servo tab control arm and pitch trim actuator. This is a view of the trim actuator try and push-rod. There is no manual trim so if the electrics or trim motor fail, the trim will be locked in the last position. A view inside the aft fuselage of the tensiometer on one of the stabilator cables. Both cables have to be tensioned to 35-45 lbs and at the set time, adjust the upper and lower cables to get the correct range of movements. A bit fiddly and time-consuming. So next was installation of the propellor. I had previously installed it at home to get the spinner aligned and the pitot tube fitted, but hadn't tried setting the blade pitch angles. A view of the inclinometer showing the propellor blade pitch using the Vans'supplied alignment tool. It took a while to get both blades to the same angle (71.4 degrees specified by Vans). Before ground running, Jerry checked the blade-tip run-out for me and it was fine. Next came the wings. I had some work to complete with the AoA sensor installation on the left wing as well as fittng the registration letters. I also had to remove the blue plastic and clean off all the sharp points from the pop rivets. Left wing on trestles all cleaned and ready for the registration, with the right wing on the transport stand with just the blue plastic to remove from the flaperon. Final registration letters fitted on the underside of the left wing. These are temporary stickers just for the test flying phase and the proper versions will be sprayed as part of the aircraft painting in the new year. Any finally a complete aircraft with all controls installed and correctly rigged. In fact I had to take the wings off again to trim the flaperon skins where they were rubbing on some fuselage rivets, and to correct a problem with the stall warning connection. I had crossed 2 pins at the wing-root connection so had a permanent stall warning alert on the PFD. 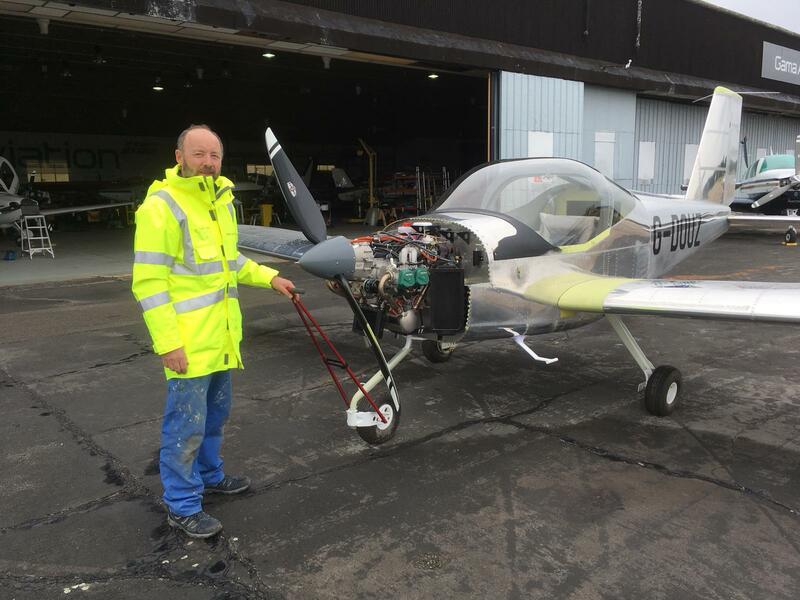 With aircraft all assembled, the next job was to leak check the fuel tank and pipework and then carry out a fuel-flow check to ensure the electric pump delivers the required volume. There we no leaks so I put on 10L of unleaded car fuel and performed the flow checks. Three tests of 15 seconds each and one of 60 seconds confirmed an average flow of 104 litres/minute, which is fine. This is the fuel flow set-up with a temporary pipe connected to the output port of the mechanical pump and running into a calibrated 3L jug. With fuel checks done, I drained (pumped out) the unleaded car fuel and had the first 30 L load of Avgas from he airfield bowser ready for round runs. Jerry came to do the post-assembly inspection and ground runs, so after a bit of additional wire-locking and priming the oil system, we went outdoors for the first time to give the engine a try. After a first test with the ignition off the ensure the engine rotated, it fired at the first attempt. A little more choke and it was away! A screenshot of the PFD showing all of the engine parameters correctly indicating. We then performed the carburettor balance using Jerry's test kit and my first chance to get in and run the engine whilst Jerry made the adjustments. On completion, the engine runs extremely smoothly and has a ground max RPM of 5040 and an idle of 1500, so all good for flying. The final bit for the session was to see how well it taxi's and test the brakes. We had a small try in front of the hangar and then went for a loop around the taxiway, down the runway at 35 kts and back to the hanger. Yours truly putting the aircraft away. It was a rainy day but worth getting wet! All in all and excellent day and lots of thanks due to Jerry for his guidance and support. The aircraft finally moved to Fairoaks today. Hassle-free fortunately and with many thanks to Jon and Dave for their time and to Dave for supplying the trailer and his Landrover. First the fuselage. As you may notice, the aircraft wheelbase is slightly wider than the trailer bed, making for interesting loading! It worked fine with some sheets of plywood I had lying around. Dave had brought an extra ramp with the trailer so that sorted the nose-wheel. It got the attention of the neighbours and plenty of looks as we drove to the airfield. Arrival at Fairoaks - just got to negotiate the air side gate. Second trip - this time the wings and horizontal stabiliser. I hadn't considered using the wing rack for transport as I only made it for easy storage and rolling around the garage. With one extra brace and well secured with straps it did the job fine. The stabilator is on the bed of the trailer beneath the wings and wrapped in garden chair cushions and a blanket! I made another trip by car to deliver the fin and rudder along with tools and boxes of parts. Then immediately on to assembly with the empennage. End of the day, with the RV12 in it's proper home and starting to look like a complete aircraft. I have the anti-servo tab to install and then to connect the trim servo, rudder and elevator cables and do the rigging and tensions. Well it's only been a week since the last blog post, but I've been very active and have completed all outstanding construction tasks that can be done at home. So to start with this week, I completed the undercarriage and wheel fairings. Here's the completed nose-wheel fairing. Actually I've made one change since taking the picture in that I've countersunk the holes joining the two halves and I'll use Tinnerman washers and AN507 countersink screws for a flush finish. I've now also done this to the main gear fairings and the tailcone halves. A close-up of the nose gear fairing showing the internal hinge which keeps the trailing edge closed, and the hinge-pin bracket which keeps it from coming part. A really fiddly job the get the hinge installed and riveted in place. Next onto the main gear leg-fairings. Here's the right main gear with the completed wheel fairing installed and the transition fairing cleco'd to hold the leg fairing. The lower transition fairings fit very well but quite a lot of work was needed to get the upper ones to line up against the fuselage. The leg and transition fairings aren't standard Vans parts for an RV12 so I'm having to submit a modification to the LAA. The completed fairings all installed. The Vans forum suggest a 6 knot gain from the wheel fairings due to reduced drag, but probably nothing from the leg fairings. Anyway, I think it makes it look better! As you can also see, I now have the registration letters fitted in readiness for ground and flight testing. Here's the first registration decal being fitted to the left side of the fuselage. The letters were made up by a local sign-writing company at Fairoaks who do this for us at work. It's only temporary for testing and will be replaced when the aircraft is painted in the new year. First letter exposed and smoothed-down with a felt squeegee. The end result. A few minor wrinkles and bubbles don't matter. The painter will do the final version and should do a better job than me! As well as the undercarriage fairings, I've added these Knots2U aftermarket fairings to the cabin entry steps. Not just cosmetic ( probably no aerodynamic benefit), they close off the hole in the skin where the steps enter, so should reduce draughts (or drafts to US readers!). I've completed labeling all of the switches and controls. The label company didn't quite manage what I'd asked for in accurate spacing, but it's good enough. And so the finished instrument panel. All that's missing is the standby compass, which fits to the glareshield which has to be fitted to the canopy frame. I'll install this at the airfield once it's been padded and trimmed by a local car upholstery shop. The centre console cover will be fitted once I've completed fuel leak checks. All of the yellow primed areas will be covered by the interior trim and carpets. So that concludes the building phase at home in just about three years to the day from starting and about a year later than originally planned. Now to pack everything and arrange for transport. I'm intending the hire a self-drive low-loader car transporter and should be able to move the aircraft and wings in two trips (the airfield is only three miles away). All being well that'll happen in early September. Thereafter, it's final assembly of major structures, control rigging and start of engine ground testing! Welcome to my blog which covers my attempt to build a Van's RV12 kit aircraft. My name's Harry Lees and I'm an avionics engineer by training, although I do very little of that any more. I've held a PPL for over 25 years and normally fly a PA28-180. I've wanted to build my own aircraft for many years and now finally have the time and funds as kids have (almost) flown the nest and work has taken more of a back-seat. Disclaimer: Anything shown in this blog is my way of doing something and I make no recommendation or accept any liability for anyone else to copy what I may have done!